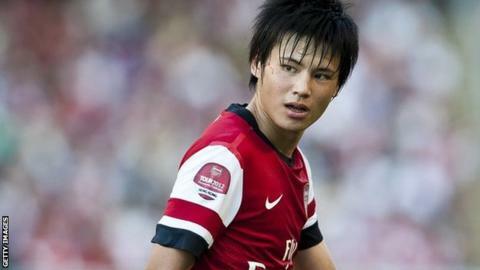 Wigan have completed the signing of Arsenal midfielder Ryo Miyaichi on a season-long loan. The Japan international has made just two senior competitive appearances for the Gunners, which both came in the League Cup last season. Miyaichi, 19, spent the second half of last season on loan at Bolton. Wigan signing a midfielder will cast further doubt over Victor Moses's future at the DW Stadium amid continued interest from Chelsea. Former Feyenoord midfielder Miyaichi made 14 appearances for the Trotters during his five-month stint at the Reebok Stadium, scoring once, but could not stop Owen Coyle's side from being relegated. Miyaichi joined the Gunners in January 2011 after impressing manager Arsene Wenger on trial.